This article is about the ABC television series. For other uses, see After School Special (disambiguation). ABC Afterschool Special is an American television anthology series that aired on ABC from October 14, 1972, to July 1, 1997, usually in the late afternoon on weekdays. Most episodes were dramatically presented situations, often controversial, of interest to children and teenagers. Several episodes were either in animated form or presented as documentaries. Topics included illiteracy, substance abuse and teenage pregnancy. The series won 51 Daytime Emmy Awards during its 25-year run. In 1993, TV Guide named the series the best kids' show of the 1980s. 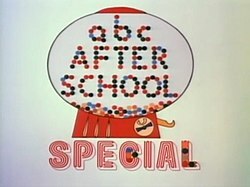 ^ a b c d "Full List of ABC Afterschool Special Episodes". Ranker. ^ "The Lost Art of TV Guide Advertising, Vol. 8 of 265,890". platypuscomix.net. ^ "Article". Anchorage Daily News. March 13, 1988. ^ Margulies, Lee (March 11, 1988). "ABC-TV to target literacy". The Bulletin. Central Oregon. The Bulletin and LA Times. Retrieved May 19, 2016. ^ Heffley, Lynne (October 15, 1988). "Television Reviews : 'A Family Again' Shows the Impact of a Child's Death". Los Angeles Times. ^ TV Guide April 17–23, 1993. 1993. p. 79.